John Cooper Rutherford, 80, of San Angelo passed away Thursday, Aug. 2, 2007, at his residence, surrounded by his wife, Dede, and brother Bill. John Cooper Rutherford was born at home in rural Haskell County, Texas, on Oct. 27, 1926, to John Walter and Bernice (Williams) Rutherford. Daddy was a farmer and Mother was a schoolteacher. Cooper was baptized at an early age in the Baptist church. Cooper graduated from Munday High School in May of 1941 and entered Hardin-Simmons University in September 1941 at the age of 15. He volunteered for the U.S. Navy in August 1943 and shipped out in November 1943 after his 18th birthday. He served in the Pacific Theatre aboard the USS Skagit and the USS Enterprise as radar man and was honorably discharged at the end of the war with the rank of petty officer. He re-entered Hardin-Simmons University, where he played football, the cornet and earned his pilot's license. He graduated May 1949 with a B.B.S. and worked on his master's there and at Tech. Cooper started his 37-year career with the A.T. and Santa Fe Railway in Lubbock in August 1949, where he met his future bride. Theirs was a typical '50's fairy tale love story — they met at the "corner drugstore." She was the little country girl come to town to go to college, and he was the mature, well-mannered, good-looking guy. He married Delores "Dede" Bodkin on Jan. 12, 1951. He taught her to fish, and she taught him to dance. Their beloved daughter was born on Jan. 12, 1962. His promotion carried him to Amarillo and then to San Angelo in January 1971, where they chose to "stay put." He was the last Santa Fe Freight agent San Angelo had. He was the regional freight office director when he chose early retirement rather than transfer. Cooper was a 45-year Mason and a Shriner. 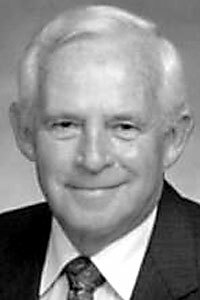 He was past president of Downtown Rotary, the Salvation Army and the Food Bank. He also served two terms in the Silverhaired Legislature. He was known around town as "Mr. Santa Fe." He was known among his peers in Lubbock and beyond as a prince. His word was his bond. He was a generous person, a mild-mannered gentleman and a fiercely devoted family man, and he was deeply loved by his large and extended family. Cooper is survived by his wife of 56 years, Dede; one daughter, Denise, and husband Andy Reiner; one very precious granddaughter, "Sweetiepie" Kayla Reiner; brother Bill and wife LaWanda of Lubbock; nephew Craig of Lubbock; niece Charlotte of Victoria; five great-nieces and nephews; a host of in-laws, but one special "little sister," Bobbie of Joshua, Texas; along with many, many friends. Pallbearers will be nephews-in-law Monty Digby of Lubbock, Mickey Walker of Joshua, Terry Walker of Italy, Gary Shawn of Austin, Chuck Ball of Spearman and Clarence Bodkin of Kirtland, N.M.
Honorary pallbearers will be Tom Koedeintz, Buster Peek, H.D. Pearson of Houston and his golf buddies from Bentwood and Verleen Bodkin King of Kirtland, N.M.
Funeral service will be at 3 p.m. Saturday, Aug. 4, in First Baptist Church chapel. A private family burial will follow in Lawnhaven Memorial Gardens. Memorials may be made to United Blood Service, Hospice of San Angelo or to a charity of your choice.